What is achiote? In english Achiote means Annato. It comes from a tropical tree that is native to the Americas and is used for industrial and culinary purposes. The name Achiote derives from the Nahuatl word for the shrub, achiotl. The Annato plant has pink flowers and ovular leafs, the seeds or fruit is a capsule covered in short, red prickly, stiff hairs or spines. The Achiote Fruit Capsuls are brown and reddish at maturity and heart shaped. 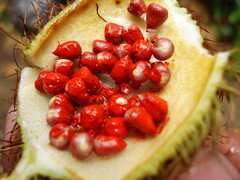 The pods or capsules will split open in half when mature, revealing 50 seeds covered in red pulp. The fruit from the Annato tree are not edible, the red orange reddish pericarp or pulp that covers the triangular-shaped seeds is used for its dying properties and to give flavor to dishes. The seeds range in colors from Yellow to orange and red to black. The yellow and orange seeds are commonly used as a dye for cheeses and other dairy products. The red seed is used to add flavor to Mexican, caribbean and Latin American Dishes most commonly used in the caribbean, and the Oaxacan, and Yucatecan regions of Mexico. The Achiote originates from Merida, Yucatan and the Annato seed was first introduced to the Americas by the indigenous people of the Maya and Aztec tribes. It was used as body paint; specifically for Lipstick giving the Annato tree the name of "Lipstick Tree", food coloring, clothing dye and for writing scriptures. Annato has a sweet and peppery taste and scent, and has been described to have an earthy, bitter flavor. Achiote works for your needs in either one of its varieties. Traditional recipes where achiote is used include the very famous Cochinita pibil (Mexican-slow roasted pork dish) for color and flavor, chicken in achiote and caldo de olla.To give a reddish color and flavor to any recipes like tamales, meat, fish or rice (arroz rojo) dishes, substitute vegetable oil with Achiote oil. Recado Rojo or Achiote paste is a thick, earthy flavored, deep-red seasoning that is slightly bitter, made with red Annato seeds mixed with other spices and ground into a brick shaped paste. It's preferred in the Yucatan and Oaxacan cuisine because for its distinctive flavor and coloring. Achiote is a signature ingredient in every Mexican kitchen. You can either rub the Achiote paste directly on the meat, pork, fish, shrimp or seafood to which it gives a deep-red color and flavor. These can also be marinated with a sauce created with the paste by dissolving it with either orange juice, vinegar, lime juice or oil. Once the meat is marinated or the Achiote paste is rubbed on it, you can bake, broil, grill or barbecue. The Achiote paste may also be added to a corn base for red tamales or empanadas to give them color and a spicy flavor. When using Achiote in the kitchen make sure to wear an apron, because the dye properties in the Annato are very strong and therefore can stain your clothes. Achiote is used in a variety of ways for example Achiote paste, achiote powder, achiote oil, and achiotina. Achiote is sold as crushed seeds, whole seeds and/or brick version of the paste. Examples of brands that sell Achiote (Anatto) paste are: El Mexicano, Achiote Chef, La Perla del Mayab, El Yucateco. For Achiote in its powder version, Bijol is a great brand. Achiote (Anatto) is the main ingredient in Goya's popular spice blend "Sazon." You can find Achiote in grocery stores and online wherever Mexican, Middle Eastern and Latin American products are sold. MexGrocer.com offers you all of these Achiote brands for you to choose from to prepare all your favorite dishes. In Mexico and Latin America Anatto is commonly known as Achiote or Achote as it is pronounced, although in the Philippines it is known as Atsuwete or Acheute. 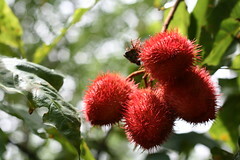 Other names for the seed include Annatto, Anatta, and Annato.